Interactive voice response (IVR) is a technology that allows Bitrix24 Telephony and CRM to interact with your clients through dialpad input. If you receive large volume of incoming calls, it may be helpful to have IVR system filtering them for you and routing these calls to desired destination. Another popular use case scenario is when the client needs to get some basic information & human call operator participation is not required. In these instances, you can record voice message response and play it to the client. ● Clients can enter an extension number to reach a particular person. Important: you should have main telephony number configured before going to IVR Setting. Go to Telephony > More > Configure IVR. You can choose between 2 voice menu sources: audio file or text. If you choose to add text, it will be spoken to callers whenever they reach you by phone (language, voice, speed & volume can be configured). 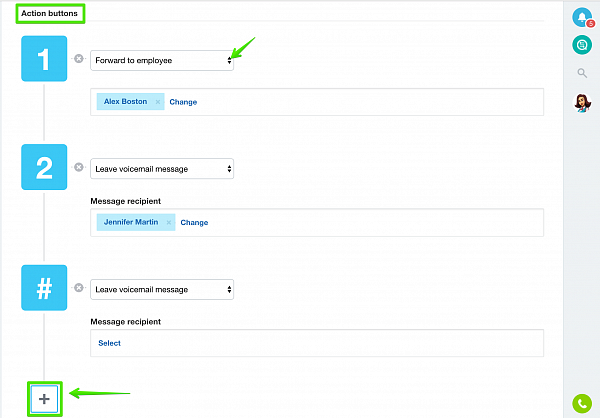 Perform action if no button was pressed option gives 2 choices: exit IVR or repeat voice menu recording. Phone buttons should be configured as Actions Buttons. 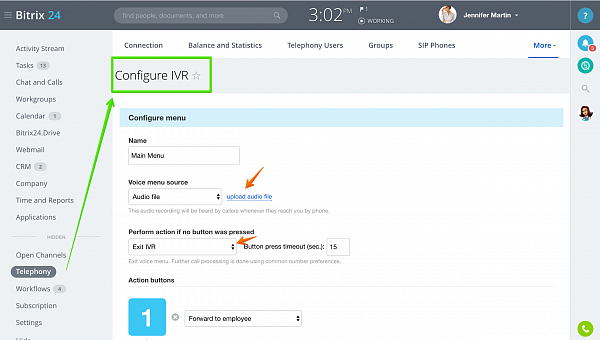 If you have set calls forwarding for your IVR actions buttons, then you can configure operators groups under Telephony > More > Telephony Settings > Groups (Queues). Here you can select Bitrix24 users who will answer calls to this number. 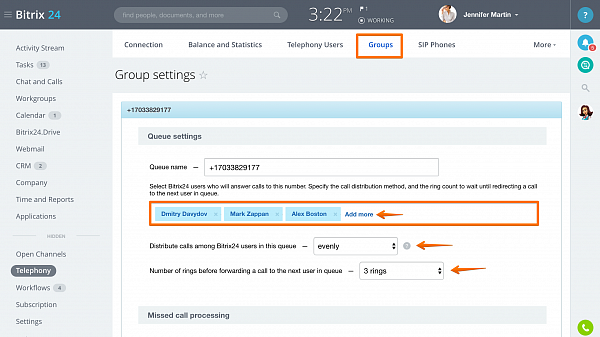 Specify call distribution method and the ring count to wait until redirecting a call to the next user in queue. IVR option is available to Bitrix24 Standard (two levels) or Professional (unlimited levels) plan subscribers only.